The Nature Conservancy of Canada (NCC) has broken ground on an ambitious project to restore close to six acres (close to 2.5 hectares) of wetlands in the Cowichan Estuary on Vancouver Island. The wetlands are in the low-lying section of NCC’s Chase Woods Nature Preserve. Before being drained and converted to agricultural use, these marsh wetlands connected to the Cowichan Estuary. They provided important habitat for rearing salmon and for waterfowl in the winter. With approximately 60 per cent of shoreline marsh habitats in the Salish Sea having been lost, opportunities to restore these ecosystems are rare and important. The drained marshes on the Chase Woods Nature Preserve provide an exciting opportunity for coastal wetland habitat restoration. 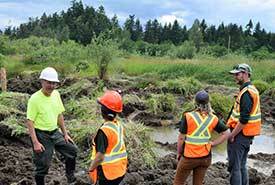 Under the direction of wetland specialists Robin Annschild and Tom Biebighauser, and working with Cowichan Tribes and the Province of BC, the project broke ground on June 25, after two years of planning and development. The first phase focuses on re-creating the historical slow and winding path of a creek that had long ago been diverted into a deep ditch, to drain the marshland through which it flowed. Prior to breaking ground, archaeological impact assessments were undertaken through soil test pits. Archaeologist Genevieve Hill and Cowichan Tribes cultural monitor Harold Joe are providing direct and ongoing oversight throughout the project. adding woody debris and transplanting of native plant species. The next step is simply waiting for water and wildlife to return. NCC will monitor the vegetation, erosion and winter/spring bird species to document the significant changes to the former hayfield and assess next steps or updates to the site. Funding for the Chase Woods Wetland Restoration Project came from the Katzaa Foundation, WC Kitchen Foundation, Coca-Cola Foundation and the Pure Green Earth Fund.